There are a large number of different disposable diapers on the market today. Many people look for the cheapest pack only to find out that the diapers are terrible and don’t do anything to prevent leaks, stop the baby’s clothes from getting wet or anything else that a good quality disposable diaper is supposed to do. We have listed the three top rated disposable diapers and their features to show why these three are customer favorites. The purpose of a disposable diaper is to keep your baby comfortable and dry during the days and nights, until they are potty trained and no longer require their use. There are many brand name disposable diapers as well as lines of generic brands as well. There are specific features that many disposable diapers have that are very beneficial to keep your baby comfortable and dry and preventing problems like diaper rash. These three top rated disposable diapers that we have reviewed are customer favorites for many reasons. Most of them have been around for a very long time and have built up a reputation for quality and reliability. We have done research and talked to experts in the baby industry about what makes a disposable diaper great. The results of our research led us to the three top rated disposable diapers that we have listed here. Our goal in these reviews and the detailed buyer’s guide that follows is to help you save time and money and to choose the disposable diaper that is going to work the best for your baby’s needs. If you are concerned about chemicals and unnatural products around your baby, you will love Earth’s Best Chlorine Free Disposable Diapers. Not only are they safer for your baby, they’re safe for the environment too. Earth’s Best diapers are made with renewable resources like corn and wheat and do not have harmful latex which can cause skin irritations, dyes or perfumes. The design of these disposable diapers has breathable sides that reduce any chafing your baby might experience with traditional diapers. The moisture barrier cuff prevents leaks so your baby’s clothing stays clean and dry. The refastenable grip tabs make sure your baby’s diaper fits well even in between diaper checks. Using these disposable diapers helps you do your part in reducing your own environmental footprint. 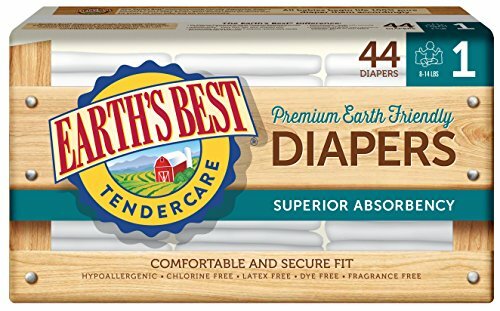 If you care about the health and safety of your baby and the environment too, you will love using Earth’s Best Diapers to do your part to help. Earth’s Best Chlorine-Free Disposable Diapers are hypoallergenic which is wonderful for babies with super sensitive skin, it is also fragrance free, dye free, chlorine free, latex free and helps to reduce the levels of petro chemicals that are present in regular diapers. 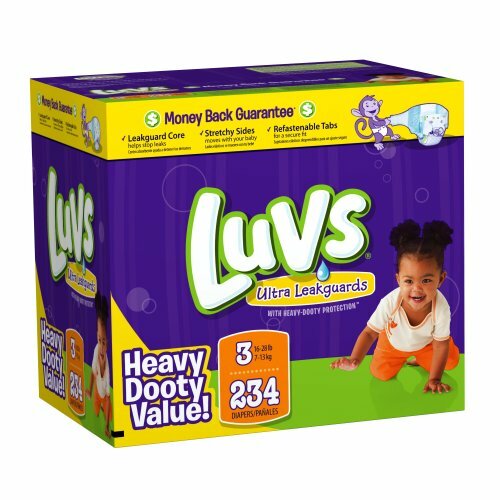 Luvs is also a very well known brand of disposable diaper but it is considered the economy version. Parents get all the benefits of a high quality disposable diaper without the super high price. The bear hug stretch premium elastic sides and the stretchy leg cuffs help stop any leaks from happening. Luvs Premium Stretch disposable diapers have a blue leak guard core that pulls wetness away from your baby and keeps them dry and comfortable. Parents who choose Luvs Premium disposable diapers can use them from day one through potty training age. You won’t have to worry about ruined outfits from messy leaks or terribly painful diaper rash from having a wet diaper against their sensitive skin all night long. The design of these diapers includes extra large tabs that make fastening the diapers easy. The tabs are refastenable as well so there is no reduction in fit if you have to undo them to check and refasten them again. There are unique designs on every diaper for parents and babies to enjoy. The company offers an iron-clad money back guarantee that states if any parent is not 100%b satisfied with the performance of Luvs Premium disposable diapers, they will refund their money. Talk about diapers and the word Pampers will almost always be mentioned. Pampers have been around for decades and is still the #1 choice of US hospitals everywhere. The Swaddlers disposable diapers are created to be blanket soft and have a unique liner that pulls wetness and mess away from the baby’s skin. This keeps your baby comfortable even when you can’t change them immediately. Equipped with a color changing wetness indicator, parents will be able to easily see if the baby needs a change. Since Swaddlers disposable diapers are for very young ones, they were created with a notch at the umbilical area to make room for the umbilical cord area to heal without becoming irritated. 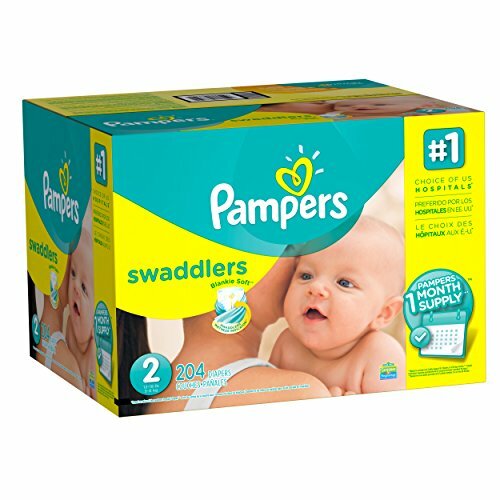 Pampers Swaddlers disposable diapers are available in sizes Newborn to size 2. They are specially designed to help distribute the wetness evenly for up to 12 hours which makes them perfect for overnight. When babies are very young they can sometimes use the bathroom 8 to 10 times a day. Pampers Swaddlers will ensure that your baby stays dry and comfortable through the night and during the day as well. Purchase one of the best diapers you can buy for your baby and never worry about uncomfortable leaks or irritated skin from wetness being up against it again. The products that a baby uses are very important to a parent. They always want the best for their children and in many cases will look for products that reduce the amount of chemicals that are used in products such as disposable diapers, baby food, wipes, lotions, shampoos and more. These three top rated disposable diapers have been chosen as the top choices due to their popularity and performance. All three are popular with customers due to their features which include moisture lock legs to prevent leaks and many other special things. Not every parent has the means to ONLY use healthy products or cloth diapers. Sometimes disposable diapers have to be used due to work obligations or maybe the parent just doesn’t want to mess with cloth diapers. Whatever your reason is for using disposable diapers, these reviews and the buyer’s guide below will prevent there from being hassles when you tell them you have switched to a disposable diaper that does exactly what you want it to. What is a Disposable Diaper? You may not even think about it when you go to buy disposable diapers. In fact, as a parent, you may not realize how important that disposable diaper is…until it doesn’t stop leaking and makes a mess everywhere. The wrong kind of diaper can cause all kinds of grief to the parent and can cause suffering and discomfort to the baby as well. Sometimes the wrong kind of disposable diaper will cause a rash of some type to break out on the baby. Once you understand the needs of the baby and what disposable diapers can do for the health of the baby’s skin, you will be able to choose the right type of disposable diaper for your baby. Disposable diapers are constructed very similarly to cloth diapers. There is a multi-layered inside that contains a super absorbent layer and then the outer protective layers and cover. Disposables are actually more absorbent than cloth diapers due to the materials used and the process in which disposable diapers wick away the wetness and mess until they are able to be changed. The inside layers of a disposable diaper contains a chemical gel compound that absorbs and retains liquid. Sometimes this chemical is sodium polyacrylate but there is a growing concern about the health and safety of babies and then environment so ingredients used to make a disposable diaper are changing. Nowadays it is not uncommon to find disposable diapers made from biodegradable materials. Things like natural fibers and fabric that is just like paper are being used in diapers rather than the old fashioned chemicals that so many are becoming worried about. One mistake new parents especially, tend to make is that because the disposable diaper is so absorbent, they will incorrectly think this means they can change the diaper less frequently. The super absorbency of disposable diapers is not so the baby can be left in a wet diaper longer; it is so they can get through the night without being woken up by cold, wet diapers that can disrupt their sleep. The only thing that will keep the baby’s skin from getting diaper rash is to be changed frequently and to keep the skin clean and dry. Lack of air circulation is a common problem with disposable diapers since they are made with a plastic outer layer that prevents leaks. Another potential cause of rashes on your baby’s skin is the perfumes and fragrances that are oftentimes added to disposable diapers to mask the smell is they have gone to the bathroom in then diaper. These fragrances and perfumes can cause skin irritations and rashes. This is another reason that many disposable diaper companies are switching to all natural ingredients in their disposables. There are different types of disposable diapers that can cater to specific needs. We have listed the more common types of disposable diapers below. Newborn diapers – newborn diapers are disposable diapers that are specifically designed for newborns. One of the common features of newborn diapers is that they have a cut out for then belly button area since it is usually not healed or fallen off for a week or two after the birth of the baby. Newborn diapers are very small and only fit up to about 10 pounds. Older Baby Diapers – Some companies have diapers in stages or transitions to accommodate the age and activity level of the baby. A baby that is turning over and crawling needs a diaper that can handle all that movement. This is why disposable diapers that are in stages work so well. Match up the disposable diaper to the right stage your baby is at so they are always protected from leaks and accidents. Toddler Diapers – Toddler disposable diapers could be one of two designs depending on the company. Some toddler diapers are simply designed for the baby that is walking and moving around. Other toddler diapers are designed more like regular underwear and can be pulled up and down. Toddler diapers are typically thinner than the disposable diapers for younger babies that are not so active. Toddler disposable diapers have stronger tabs as well since they may be removed and out back on more often due to learning to be potty trained. Overnight Diapers – These disposable diapers are especially designed for use overnight and are made with extra absorbent materials that can handle multiple wettings. The overnight disposable diapers are designed to keep your child dry and comfortable overnight while they sleep. Swim Diapers – These diapers are more of a specific duty type disposable, but they are very popular in the warm months where going to the beach or pool is common. Swim diapers work just like regular diapers except they are made with a special absorbent material that enables them to go into the water without fear of the diaper overfilling or bursting open and contaminating the pool. As a baby grows from newborn age, his or her diapering needs change. We have broken down the changes that most often occur and let you know what type of diaper will work the best for them. Newborn – 4 months– Newborn and size 1 diapers are two different things. A newborn diaper will typically fit your baby until they are 10 pounds which isn’t much time at all for some babies. The cut out that newborn diapers have accommodate the belly button and keep the diaper from chafing against the umbilical cord. Newborn diapers are not as absorbent as older baby’s diapers due to the fact that they usually get changed so often at this age. After newborn they will move to larger diapers but since they are still not moving around very much it is easy to keep the diapers from leaking. Ages 4-8 months – Your baby will be starting on solid food and that means that their diapers will be much messier than they have been on just formula or breast milk. Having a good disposable diaper that fits well with leak guards is what you will want to look for at this age. In addition since your baby may be sleeping through the night, absorbency is very important. The overnight diapers are great for this age when they are sleeping and can keep them comfortable and dry until morning. Ages 8 -24 months – A lot goes on during these months and the disposable diaper you choose needs to reflect that. Your baby will start crawling during this time and as they get older they will start standing and even walking. It is important to get a disposable diaper that fits really well and has built in leak guards especially around the legs where most leaks happen. The older stages of disposable diapers from 3-5 are designed for the active baby. They are very absorbent and prevent leaks as well as pulling away wetness during extended wearing times such as overnight. The main thing that parents want from a disposable diaper is comfort for their baby. Great fit, absorbency, and large attachment tabs are the three most important factors that a parent will look for when they choose a disposable diaper for their child. With so many disposable diapers on the market today, choosing the right brand can feel overwhelming. The reviews we have provided of three of the top rated disposable diapers and the buyer’s guide that helps parents understand the differences between the different stages will give parents the education that they need to make an informed decision about which diaper and which brand is the best. Parents choose diapers based on many different factors: price, absorbency/non-leaking properties, reputation, design and availability. Make sure that the diaper you choose provides everything you are looking for in a diaper. Your baby’s skin will appreciate the effort you have made to find a good quality diaper with excellent absorbency that fits well and keeps them comfortable. Linda is a proud mom of four and loves researching products. She is our writer for the Baby and Health and Beauty categories. She was a nutritionist in the Chicago area for 12 years before joining the ThoroughlyReviewed team. When she's not researching she enjoys weekend getaways with her family at the lake.